Are you or a loved one detained under the Mental Health Act? Get expert advice and representation. Our firm offers specialist legal advice and representation in the area of Mental Health Law. 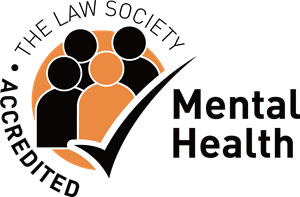 All of our lawyers that specialise in this field are members of the Law Society Mental Health Law Accreditation Scheme. We are experts in all aspects of the Mental Health Act. We offer advice and representation to patients detained under the Mental Health Act, whether this be by Section 2 or Section 3 of the Mental Health Act or by an order of the Criminal Courts and clients that may be subject to recall on a Community Treatment Order or Conditional Discharge. We are contracted by the Legal Aid Agency to provide publicly funded advice and representation. The very nature of mental illness means that those affected are some of the most vulnerable people in our society. Whilst we understand that mental health service providers are there to help treat and rehabilitate patients it is of the utmost importance that patients have their legal, statutory and human rights protected and advanced. We are here to ensure that those rights are protected and that patients have access to one of our qualified and accredited lawyers at short notice. The main statutory protection for detained patients and patients that could be potentially recalled to hospital has the right to have their section reviewed by a Mental Health Tribunal. Such is the sensitivity and complexity of this area of work that only those lawyers that have undertaken additional specific training and attained panel membership with the Law Society are allowed to act for patients at tribunal. All of our lawyers are so accredited. Our lawyers have a wealth of experience and knowledge in this area of law. In addition our lawyers are all accomplished and highly regarded advocates in their own right. We also make a point of continuity of representation and will represent our clients at CPA and Hospital Managers' meetings. All representation and advice for a Mental Health Tribunal is funded by the Legal Aid Agency at no cost to the patient. It is non means tested and patients are automatically entitled to free representation before a tribunal. We can offer other publicly funded advice and assistance to patients and the Nearest Relative subject to financial eligibility for Legal Aid. It is a sad fact that people with Mental Illness are disproportionally represented within the context of the criminal justice system. Our mental health lawyers are also experts in the field of criminal law. We therefore have the unique benefit of being equipped to offer continuity of advice, assistance and representation both in the sphere of Mental Health Law and Criminal Defence. If as often happens, a patient is interviewed by the police in hospital, we are qualified to represent them at police interview and at the criminal courts if charges are subsequently forthcoming. Should you wish to have any more information regarding the Mental Health legal services that we provide please use the Contact Form on this website or contact our Kings Heath office on 0121 200 2414.